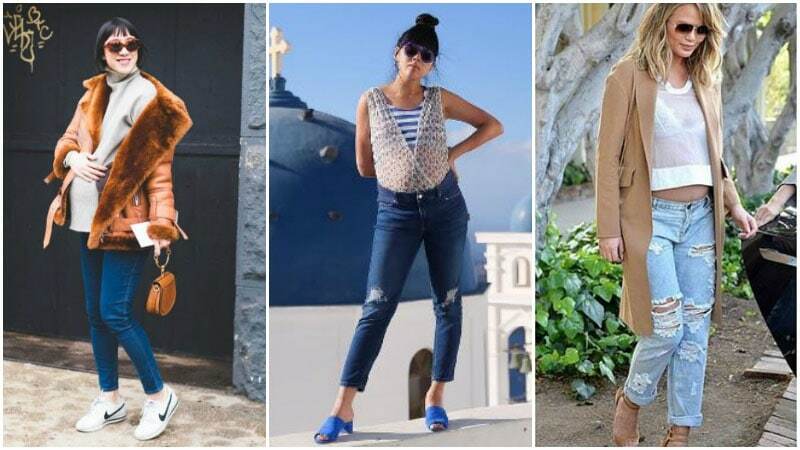 While in the past maternity clothes might have meant oversized garments that were comfortable but unfashionable, today is thankfully much different. In 2017, maternity clothes are more stylish than ever before. Now, your beautiful baby bump is something to be shown off in the latest styles rather than hidden away under a mountain of fabric. 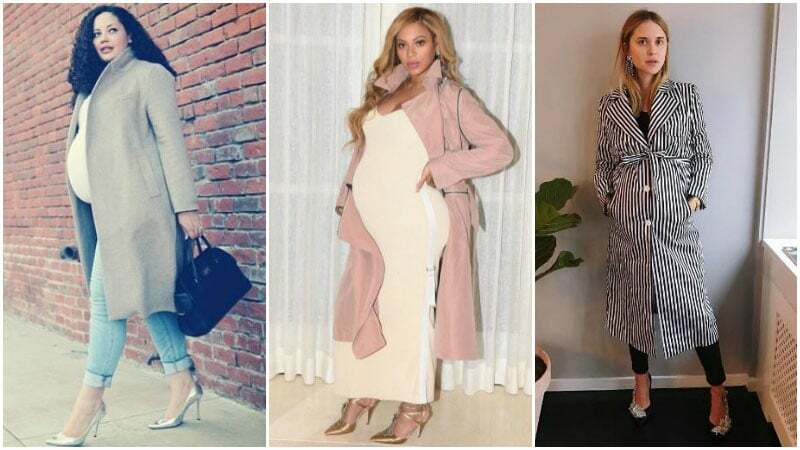 Thanks to a wave of stylish celebrities like Beyonce and Blake Lively, pregnancy has a new set of fashion rules and plenty of chic trends to try. From gorgeous fitted dresses to awesome off-the-shoulder tops, trendy maternity clothes have never been easier to find. 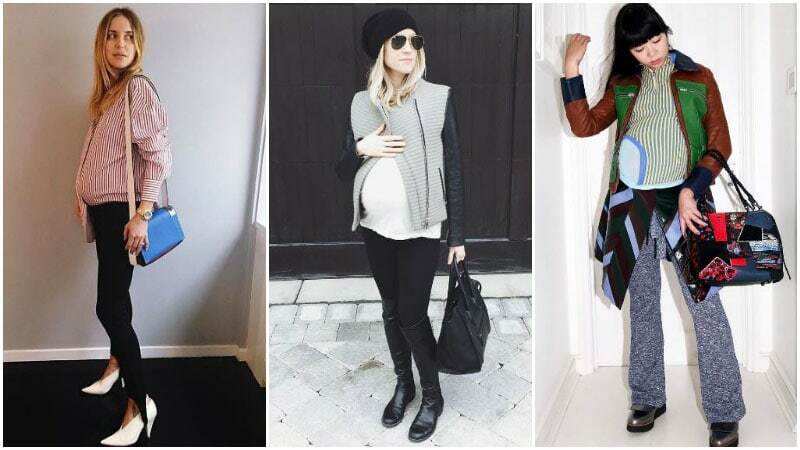 Just follow the lead of your favourite celebs and style stars to see the maternity trends that you should be rocking right now. Finding a few great maternity dresses is essential to seeing out your pregnancy in style. Instead of choosing just one dress type and sticking to it, select a couple that will keep you covered for both casual and more formal occasions. For casual outings, a T-shirt dress, such as Kristin Cavallari’s, will be cute and comfortable. For more formal events, look to Blake Lively for inspiration and rock a pencil dress. If you’re looking for something that will transition from day to night, a chic black maxi dress like Ciara’s will work well. Just pair it with sneakers during the day and swap to heels or wedges during the evening. Due to their fabrication, which isn’t overly stretchy, denim jeans can be a difficult purchase to make while pregnant. As such, finding a pair that is not only comfortable but also fashionable can be tough. As Eva Chen and Susie Bubble know, skinny and cropped styles make a great option for balancing a top-heavy pregnant figure. Invest in a pair with a stretchy waistband that sits comfortably around your bump. Then, pair it with standout styles on top for a fashion-forward look. If you prefer a wider style of jeans, look to Chrissy Teigen’s boyfriend cut instead. Choose a pair that features a low-rise and sits below your bump for a comfortable feel. When it comes to maternity tops and shirts, it’s worth investing in a few on-trend statement styles as well as a collection of classic designs. Comfortable T-shirts and cotton button-ups are ideal for simple casual looks. In particular, off-the-shoulder styles and designs with horizontal stripes will show off your bump in a chic way. A denim shirt is also a great basic option that is easy to wear with either jeans or leggings. You can even try wearing a denim shirt over a T-shirt like Kristin Cavallari for a stylish spring or autumn outfit. As for statement styles, look to street style star Pernille Teisbaek for inspiration. Off-the-shoulder tops and tie waist shirts are just two trends that you can try for a fashion-forward maternity look. Jeans aren’t the only type of pants that you can wear during pregnancy for a stylish look. Leggings and other trouser styles can also create a gorgeous outfit when worn in the right way. To rock comfortable leggings and appear chic, opt for either a cool athleisure outfit or a sleek, minimal style. Kristin Cavallari’s leggings outfit with knee-high boots, a white T-shirt, and contrast sleeve jacket is an excellent example of chic monochromatic maternity wear. For a more formal look, opt for slim cigarette pants instead. These can be paired with anything from a simple sweater with sneakers to a camisole top with heels for a stylish look. Think big, flowing maxi skirts are the only style that you can wear while pregnant? Think again. There are plenty of other options that provide a flattering look for pregnant figures. In particular, midi skirts are an excellent style that pairs perfectly with a bump. 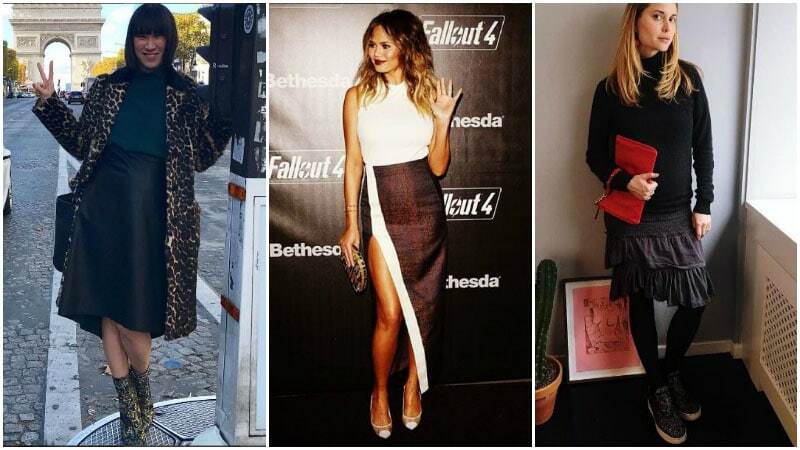 Choose between a classic pencil skirt or statement styles like Chrissy Teigen’s split skirt or Eva Chen’s leather design for an on-trend outfit. Miniskirts can also make a great look and show off your legs. To ensure the look stays balanced just choose a loose top and wear it untucked. When cold weather strikes, it’s time to pull on your coat. But how do you wear a coat while pregnant without supersizing your silhouette? The answer is all about balance. Longline coats, such as Beyonce’s, can make a great option for elongating your shape and balancing a big bump. To show off your shape more, wear your longline coat open with a fitted dress underneath. Alternatively, consider a style like Pernille Teisbaek’s that belts above your bump. To wear shorter and thicker styles of coats, choose skinny jeans to complete your look and create balance. Belts are a fantastic way to accessorise your maternity style and define your baby bump. If you’re wearing a coat or dress, choosing a belt that sits above your bump will create the chicest look. Select a thicker style with a large buckle to add a focal point to your outfit and create a fashionable look. If you’re wearing jeans, try a low-rise style and pair them with a belt that sits below your bump. A skinny belt will be the best choice for this outfit and will define your bump without making it appear larger than it is. Just remember to choose a chic black or brown leather style and to tuck in your top to show it off. Swimwear can be a fun way to show off your pregnant belly in style. Today, there are plenty of cute and chic maternity swimwear options for you to try. If you like an elegant look like Chrissy Teigen’s, try a one-piece with a low-cut top in a classic colour like black or navy. If you want something a little more playful, such as Susie Bubble’s swimsuit, consider a style with a pattern or print and plenty of colours. Of course, one-piece suits aren’t your only option. Bikinis, like Candice Swanepoel’s, can also provide a trendy beach or pool look while letting your bump breathe. Try a T-shirt dress for a cute daytime look or a sophisticated pencil dress for an evening occasion. Choose skinny or cropped jeans to balance a big bump in style. Invest in a mixture of basic tops, such as striped T-shirts and denim shirts, and statement styles, like off-the-shoulder tops. Instead of restricting yourself to flowing maxi skirts, try statement midi designs and miniskirts paired with loose tops. Accessorise your look and define your baby bump by partnering dresses and coats with a thick belt worn above your belly and low-rise jeans with a skinny belt worn below.